Over the last three months, the annualized rate of inflation for the core index without shelter is less than 1.0 percent. A 2.4 percent jump in energy prices in October caused the Consumer Price Index (CPI) to rise by 0.3 percent in the month, and lead to an increase over the last year of 2.5 percent, up slightly from the 2.3 percent rate in September. The core CPI rose 0.2 percent in October. It is up 2.1 percent over the last year. Rents continue to be the main factor sustaining this rate of inflation. The shelter index rose by 0.2 percent in October and is 3.2 percent over the last year. The core index excluding shelter rose by just 1.4 percent over the last year. Inflation in all major areas apart from shelter appears to be well under control. The medical care index rose 0.2 percent in October and is up by 1.7 percent over the last year. Prescription drug prices fell by 0.6 percent in the month, their second consecutive decline. They are now up just 0.8 percent over the last year. It is important to remember that this index only measures changes in the prices of drugs already on the market, it is not reflecting the prices charged for new drugs. New vehicle prices fell by 0.2 percent in October and are now up by 0.5 percent over the last year. Used car prices jumped by 2.6 percent in October, but this follows a 3.0 percent price decline in September. They are up by 0.4 percent over the last year. Apparel prices rose by 0.1 percent in October and are down by 0.3 percent over the last year. College tuition costs jumped by 0.6 percent in October, but that follows a rise of just 0.1 percent in September. They have risen by 2.8 percent over the last year, somewhat faster than the overall CPI, but well below the pace in prior years. Auto insurance continues to be a problem area with prices rising 0.5 percent in October. They are up 6.7 percent over the last year. Tobacco prices jumped 1.3 percent in the month, they are up 3.2 percent over the last year. Air fares were unchanged in October and are down by 0.5 percent over the last year. The price of hospital services was also unchanged in October after declining in the prior two months. It is up 3.3 percent over the last year. It is difficult to detect any evidence of accelerating inflation in this report. There are no major areas, apart from shelter and auto insurance, where inflation seems to be a problem. And even in these categories there appears to be some evidence of a deceleration in the last few months. The jump in energy prices in October is almost certainly an anomaly. World oil prices have been falling sharply in the last two weeks. Even if this decline does not stick, the direction of energy prices for the immediate future is more likely down than up. The annualized inflation for the overall CPI comparing the last three months (August, September, October) with the prior three months (May, June, and July) is 2.1 percent, down slightly from the 2.5 percent year-over-year figure. 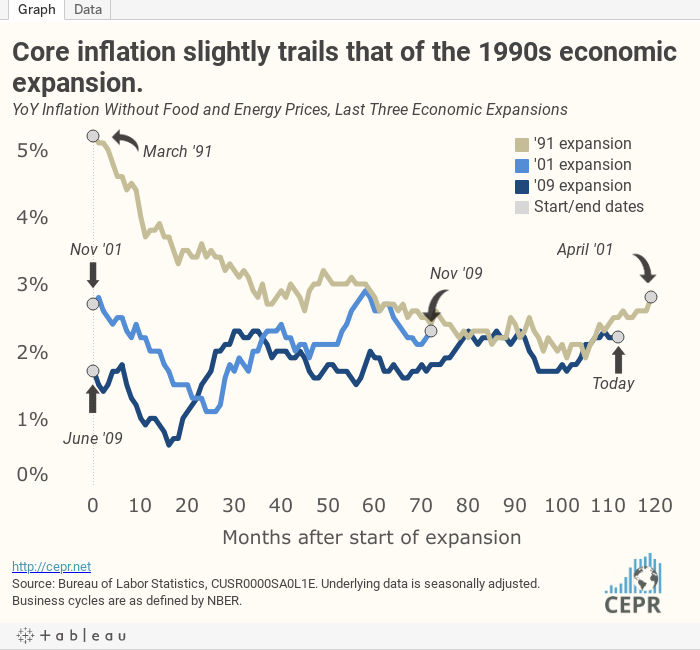 The same calculation for the core index shows an annualized inflation rate of just 1.8 percent, while for the core index without shelter, it just 1.0 percent. There is a similar story at earlier stages of production. While there are some narrow commodity groups that are showing rapid price increases, there is no evidence of any upward trend in either the overall final demand index or the core final demand index. In short, in spite of low unemployment and a modest uptick in the rate of wage growth, there continues to be no reason to believe that inflation will pose a problem in the near future.